Posted by Jacob Today, April 15 marks the feast day of a lesser known saint, but one no less important. (She is so "lesser known" that no definitive portraits or pictures were able to be found of her-- therefore, the posted pictures are simple images representing her holy life, but do not necessarily depict the saint herself). Saint Hunna (born, unknown; died 679) is remembered for her love of and service to those less fortunate than herself, despite prevailing prejudice. Hunna’s actions, at a time when the class system was firmly entrenched, created difficulties for herself in her daily life, and embarrassment for her noble husband. Yet, she did not shy away from her service to the poor, as she understood it to be her duty as a Christian. Saint Hunna was born into a privileged life, the daughter of a duke in Alsace. She matured and married Huno of Hunnaweyer, a nobleman, and together they settled in the diocese of Strasbourg (now France). Together, they produced one son, Saint Deodatus, who eventually became a monk (and then a saint!). Saint Hunna was devoted to the Lord, raising her son with constant teaching, and living the virtues of the faith. She spent her days caring for her home and estate, and in prayer, while her husband traveled on diplomatic and political missions. But this didn’t seem to be enough for Saint Hunna. In her prayer, she felt called to do more, to serve others. By the Lord, her eyes were opened to the poverty and general squalor that the peasants and servants lived in… and she felt moved to assist. Hunna began making daily trips from the estate into the local villages and fields, visiting her poor neighbors, offering them religious instruction, and working for them. 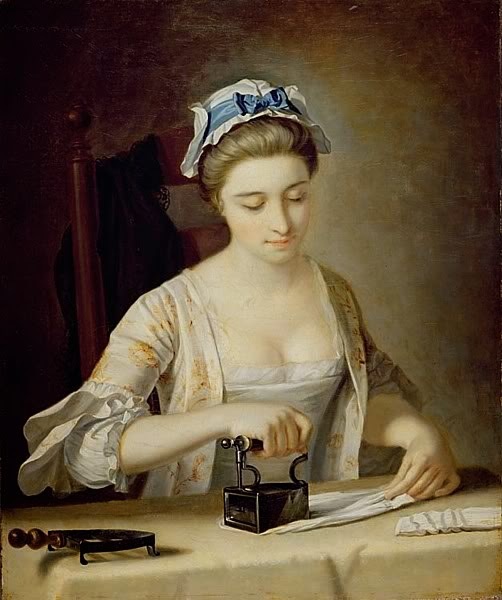 At first, she simply offered to do their laundry, earning her the title, “holy washerwoman.” Hunna would travel from home to home, collecting soiled clothing, and then spend the better part of each day washing and scrubbing the clothing clean. When the clothing was too dirty, or too threadbare to mend, she would replace it with a new article. As time went on, her washing service expanded to any task that her neighbors needed help with—cooking, cleaning, childcare, even more demanding physical labor. She also instructed in ways of cleanliness, assisting with hygiene. Saint Hunna regularly performed the greatest act of service, bathing those who were unable to bathe themselves.